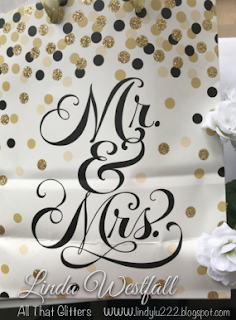 We recently attended a wedding reception and when I purchased the gift, I bought a cute bag to put the gift in and wanted a card that matched it. I tried to use a stencil that I had but the dots were too small for the look that I was going for. I started by making a mask of the sentiment and laying it in the center of a card panel of Nina Solar White cardstock. Then I took some ink in three different colors. 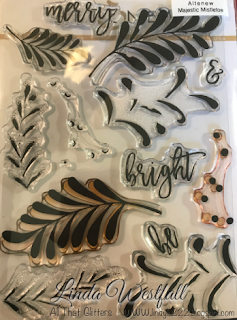 One of them being black, and stamped the dots (or berries) from the Altenew Majestic Mistletoe stamp set onto the panel. Then I took the mask off the panel and treated it with an anti-static powder tool and stamped again using VersaMark ink and gold heat embossing it. I stamped the Sentiment onto the panel using a Stamp-A-Ma-Jig so that I could stamp it twice and get a dark crisp impression. I adhered the panel to a black card base and added a white panel to the inside for a place to write the message. I will definitely be making another card similar to this one at some point. I love polka-dots! Hope you liked this and use this idea for yourself. This is elegant and you did a great job of capturing the bag with the card. 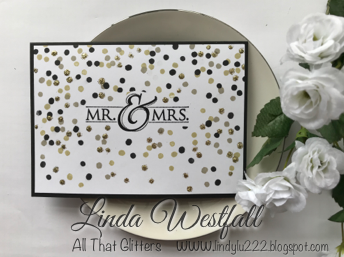 Thanks so much for joining us over at Simon Says Stamp Wednesday Challenge blog.